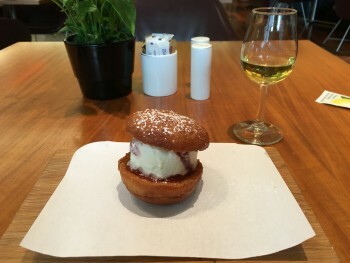 This is part two of my review of the Virgin Atlantic Clubhouse lounge in Heathrow Terminal 3. Part 1 of my Virgin Clubhouse review can be found here. To the left hand side of the lounge is a flight of stairs. Go up and you find yourself in a secluded seating area. I sat here for 20 minutes doing the interview with the Daily Express which appeared recently. Take another flight of stairs and you find yourself somewhere very unexpected – a roof terrace! Due to the joys of the Summer 2016 weather it wasn’t somewhere that anyone was choosing to linger but I can imagine it is a pleasant spot to use on a sunny day. 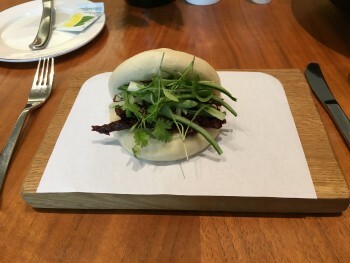 Finally, I want to talk about the restaurant. This is an open plan area in the lounge, although the layout means that you don’t have people walking past you all the time. Service was attentive but casual in a typical Virgin style. The food was excellent. I was genuinely surprised. My meal was up there on a par with the Qatar Airways restaurant in their Terminal 4 lounge. Three salads were also on offer. plus fruit salad and ice cream. There honestly wasn’t a duff note anywhere. If you heading to the Virgin Clubhouse at Heathrow, make sure you leave time and stomach space for a full meal. I haven’t mentioned the bar in this review but, trust me, there is one, it is very long and it seems to stock pretty much anything you could possibly want! Back in 1997, I remember the lounge having a sound proof room with some very expensive hi-fi equipment in it. You could put on a CD, crank up the volume and take a seat in a comfy armchair. That seems to have gone which is a shame. 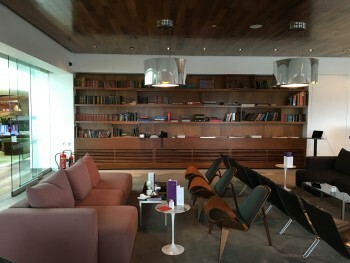 You can, in general, believe the hype about the Virgin Atlantic Clubhouse at Heathrow. 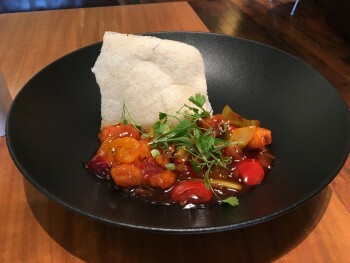 Excellent food, a great bar, lots of space, the novel roof terrace, a free haircut and a sauna and jacuzzi (and a table tennis table) – you need to be pretty churlish not to find fun in that lot. It could be better, of course. A few bottles of Krug or Dom Perignon, a better kids playroom, a broader magazine selection, a full buffet for people who don’t have the time or inclination to sit in the restaurant ….. you can always add something else. Making more of the spa treatments free would also be good, although to be fair Etihad has just gone down the same route and started charging for most of the treatments in its Heathrow lounge. British Airways still has free ‘mini’ treatments but they are nowhere near as comprehensive as what Virgin offers. The Virgin Heathrow Clubhouse should definitely be on your airline bucket list. In a few days I’ll tell you whether I believe that the Upper Class in-flight product should be on your list too …. You can find out more about the Clubhouse on the Virgin Atlantic website here. Thanks for the review, Rob – looks pretty good. I’ve got a fairly decent stash of VS miles now, it’s just so annoying they shut down Little Red though, you can only book a through ticket on revenue so I’d have to book a separate BA RFS to T5, then go landside, collect bag and check back in 🙁 Will need to do it at sometime though to use up some of my VS miles! Virgin Clubhouse LHR is still my favourite lounge in the world, JFK and SFO one are nice too (latter is airside which is a bit of a pain). 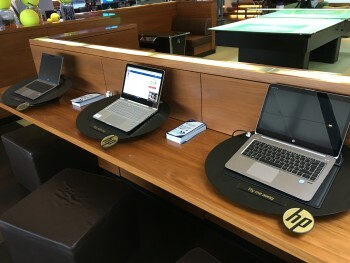 Seen BA’s T3 Club, T5 Club and FLounge (will see CCR next month, I don’t expect it to be better than Clubhouse), Centurion LAS, Business and First LAX, various AA Flagship and Admirals, and will be seeing Qatars Doha, Cathay Pacifics HKG and Quantas SYD, all first, so will have further ones to compare with…. Rob, you missed out on the shoe shine – just as you enter the Clubhouse there’s a guy who polishes your shoes while you’re using the facilities. It’s also worth mentioning that wherever you sit in the Clubhouse, the staff will come over to take you order for food and drinks. 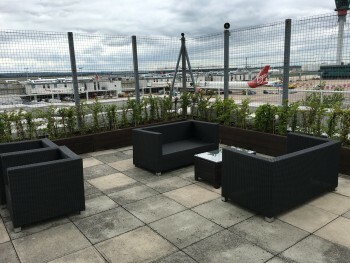 The Virgin Clubhouse at LHR remains the most impressive business class lounge in the world, in my view – even though it’s now about eight years since it was re-done. True, didn’t mention him but he was there. There are still quite a few shoe shine guys in the City so I don’t really notice them. Also a shoeshine dude at Gatwick Clubhouse, which while nice, is smaller, and much less in it. Less food too, tends to be breakfast food, and a burger, because the VS LGW flights are pretty much done by 1pm. Can’t say I done them all but the Virgin Clubhouse in Heathrow is certainly provides the best experience I have had in an airport lounge, anywhere. From the Upper Class drive up wing through to the hairdressers, the bar, the bathroom and washing facilities and best of all the salmon deli! It’s a wonderful place. The only slight criticism would be that from my experience it can get a little overcrowded in the mornings. I’ve struggled to find seating for a party of four for instance (and it’s a big place). You may have to patient for table drink and food service too during these times. But maybe that’s a little picky, there isn’t a lot VA can do about that. Overall it’s a stunning experience. And that salmon…. Looking forward to the review of the flight, from my experience the Virgin UC experience varies dependent on which plane you get. Some of the older ones can be a little worn and dated – but it’s still good overall , especially for a miles redemption). The crew service remains consistently superb though, and puts BA to utter shame. I have just about built up enough points for an Upper Class redemption for myself and wife so I am looking at destinations like Cancun as the jump off point for a trip to Yucatan. Unfortunately, Virgin flies out of Gatwick to Cancun, so we would only get the Gatwick Virgin clubhouse. This is the only Upper Class flight we will take in the forseeable future, so the question is whether we would be missing out by flying out of Gatwick. 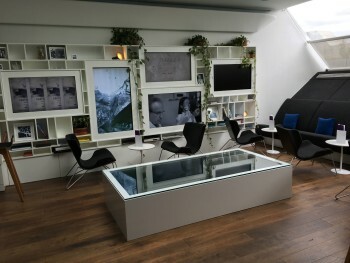 Should I make a point of flying out of Heathrow just to experience the main clubhouse? No. If you want to go to Cancun, go to Cancun. That is more important. I’d disagree – I had the same dilemma with heading to the Caribbean. I desperately wanted to try out the Heathrow clubhouse, but when I was almost ready to book, I realised my planned destination of St Lucia goes from Gatwick. After a bit of scouting around, I found cheap return flights from JFK to Turks & Caicos instead for only slightly more than 200 quid, and spent 20,000 fewer flying club miles on a upper redemption to JFK, which seemed like a fair deal, especially considering the beaches in T&C look incredible! Have a look at the 80,000 return destinations, and see if you can find a bargainous flight to Mexico. Good luck! I went diving off Cozumel for a couple of weeks (with Cancun as nearest). Cancun itself is a bit of a hole but as the gateway to somewhere else, no problems at all. Cozumel also gets over-run by our pondy cousins but as I was mostly 20 metres under, not an issue. Though the LGW Clubhouse doesn’t have all the bells and whistles of its LHR cousin, it isn’t so far behind that I’d change my destination. Indeed some on VS travel forums prefer the LGW CH based on the attitude of the staff who always seem genuinely happy that you are there and about to go on holiday. A “new” CH will open in January 2017 when VS move their operations to the North Terminal. VS is simply the best – and never ceases to show that they appreciate my business. Looks great. It’s just a shame Virgin don’t offer an upgrade voucher or 2-4-1 for Upper Class on any of their credit cards. Virgin redemptions are already cheap, in comparison to BA, adding a 241 would make them ridiculously good value compared to the competition. UC costs about £500 in tax and 80K points to the East Coast. If I could get BA flights for that, they wouldn’t be anything like as good! I am also a big fan of Virgin and I will prioritise collecting VA miles over BA any time! Me too; not least because – unlike Avios – I have a reasonable chance of redeeming them! Deli is fab. Ice-cream, Bramble cocktails. There is a pool table. The table tennis may have been a wimbledon thing? Not sure it is all year round. BA Champagne is better in CCR but overall Virgin wins hands down on the ground. I arrive about 6 hours before the flight to fit it all in- longer if I want my hair done. To see what really makes a typical VS Clubhouse so much better than a typical BA Galleries First, go to EWR or BOS (where they’re adjacent) and compare the welcome, the food and the comfort. . I note that VS will offer a flybe connection to BHD for money, when for example, requesting LAS-BHD. I assume the connection is not available as part of a redemption ? Correct, AFAIK. They also offer connections from Dublin on cash tickets. Indeed on cash tickets I think there are lots of connection options, sadly not available on redemptions!